I just had the pleasure of seeing this movie today and I am still reeling from it. I don't know how much of it is that I am a hick country boy who moved to the city and became an intellectual, but I'm feeling like it's one of the most affecting movies I have ever seen. 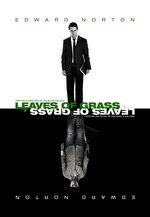 It stars Ed Norton in two roles, one of which seems absurd at the start but very quickly becomes natural. It treats redneck criminal culture fairly, if such a thing is possible. Saw this at Ebertfest a few years ago and enjoyed it highly. Um, wait. That's not what I meant. I liked it a lot. Tim Blake Nelson came out afterward and turned out to be one of the smartest people who I've ever heard talk. Neat guy.